Becoming a Growth Mindset School explores the theories which underpin a growth mindset ethos and lays out how to embed them into the culture of a school. It offers step-by-step guidance for school leaders to help build an approach to teaching and learning that will encourage children to embrace challenge, persist in the face of setback, and see effort as the path to mastery. The book isn't about quick fixes or miracle cures, but an evidence-based transformation of the way we think and talk about teaching, leading, and learning. Drawing upon his own extensive experience and underpinned by the groundbreaking scholarship of Carol Dweck, Angela Duckworth, and others, Chris Hildrew navigates the difficulties, practicalities, and opportunities presented by implementing a growth mindset, such as:forming a growth mindset curriculumlaunching a growth mindset with staffmarking, assessing, and giving feedback with a growth mindsetgrowth mindset misconceptions and potential mistakes family involvement with a growth mindset. 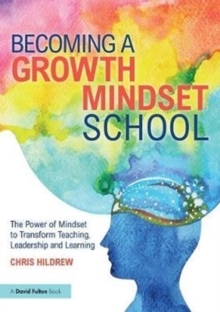 Innovatively and accessibly written, this thoroughly researched guide shows how a growth mindset ethos benefits the whole school community, from its students and teachers to parents and governors. Becoming A Growth Mindset School will be of invaluable use to all educational leaders and practitioners.